Officer jobs in this UPPSC Recruitment 2018. Last date to apply online for this UPPSC Unani Medical Officer vacancy is 01-11-2018. Submit application through official website of www.uppsc.up.nic.in. Candidates selection will be held on basis of written exam for this UPPSC Unani Medical Officer Jobs. 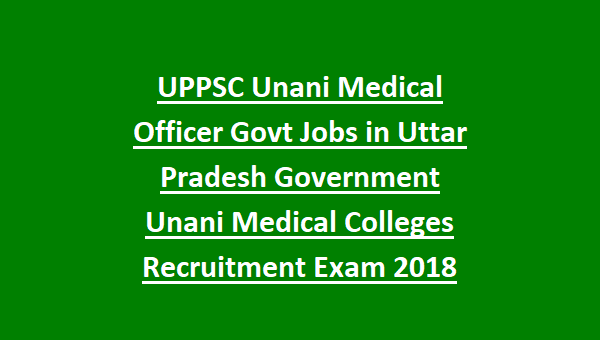 Age limits, online application process, qualification and other details about this UPPSC Unani Medical Officer jobs of Government Unani Medical Colleges are given below. There are total 25 posts in this UPPSC recruitment 2018. 5 posts are reserved for female candidates. (a)Degree in Unani Tib. Or 5 years' degree or diploma in Unani Tib of the Board of Indian Medicine, U.P. (b) Registration as a Hakeem with the Board of Indian Medicine, U.P. (c) Atleast six months professional experience of State Unani or Allopathic Hospital or Dispensary. 21-40 years as on 01-07-2018. Candidates selection will be held based on written exam for this UPPSC Unani MO Posts. Exam Pattern and Syllabus details will be updated in UPPSC official website of www.uppsc.up.nic.in. 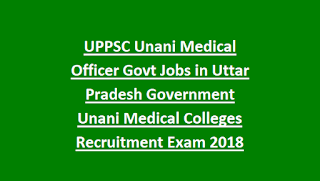 Those who are having the above said qualification they can apply online before the closing date of 01-11-2018 for this UPPSC Recruitment of Unani Medical Officer Jobs. Exam Pattern and syllabus, exam date, admit card release date, exam key and other details are updated in the website of www.uppsc.up.nic.in.